Dentures are removable structures that are used to replace missing teeth. While they take getting used to and will never feel exactly like your natural teeth, with advancements in dental technology, dentures have become more natural and comfortable than ever. 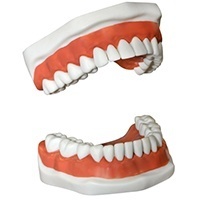 Mid Wilshire Dentistry provides two types of dentures: full and partial. When you come in for an appointment, your dentist will help you choose the type of denture that fits you best based on how many teeth are going to be replaced and the cost of the operation. With full dentures, an acrylic base attaches to your gums. The base of the upper denture goes over the roof of your mouth (or palate), while the lower denture section is crafted into a horseshoe shape to leave space for your tongue. Custom-made from impressions of your mouth in a dental lab, your dentist will decide which of the three types of dentures is best for you. --Conventional Full Denture: A full denture is inserted in your mouth after any leftover teeth are removed, and gum tissues have healed. When those tissues are healing — which could take several months — you will be without teeth. --Immediate Full Denture: In contrast to the conventional full denture, an immediate full denture is placed in your mouth immediately after any leftover teeth are removed. While these offer the benefit of avoiding any time without teeth, they must be relined within several months as the bone supporting the teeth continues to reshape as it heals. --Partial Denture: A partial denture is attached to a metal framework that connects to your natural teeth. In some cases, crowns are placed on some of your natural teeth to act as anchors for the denture. Partial dentures are very similar in style and purpose to dental bridges; only partial dentures are removable. New dentures can feel uncomfortable or awkward for the first few weeks or months that you wear them. Eating and speaking will take some getting used to, and a bulky or loose feeling is not uncommon as the muscles of your tongue and cheeks adapt to the dentures. Excess saliva, slight irritation, and a feeling like your tongue is crowded for space are all natural as you adjust to your new dentures. If you need teeth replaced and are interested in learning more about potential denture procedures to solve this problem, contact Mid Wilshire Dentistry at ###-###-#### to schedule a consultation today.